Further research by the Office for National Statistics also shows that the amount being drunk in Britain has fallen slightly. Middle-class professionals are still tending to drink more than people on lower incomes. Professional adults drink 13.8 units a week, but someone doing a manual job is likely to drink around 10.6 units. The trend to less consumption began in 2002 and is unlikely to be reflected in figures on the alcohol deaths for some years. A second report from the ONS published today suggests that most drinking takes place at home, rather than in pubs or bars. The percentage of people who had bought alcohol from an off-licence in the previous year has gradually fallen from 37% in 1998 to 27% in 2009. But the percentage of people buying alcohol from supermarkets has increased from 25% in 2008 to 29% in 2009. More people had also bought alcohol in a restaurant - up from 57% in 1998 to 62% in 2009. The Department of Health in England is launching a new television advert today to warn of the hidden damage from alcohol. It shows the effect of heavy drinking on vital organs, and is part of the continuing effort to convince people to drink within the recommended healthy limits. For a man that is 21 units a week and 14 for a woman. The figures published today will feed into a continuing political debate about alcohol. A recent report by the Commons health select committee called for a minimum price per unit of alcohol. Proposals to introduce a minimum price in Scotland are unlikely to get through the Scottish Parliament as the minority SNP government has failed to win the necessary backing from the other parties. 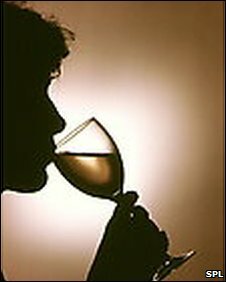 Jeremy Beadles, chief executive of the Wine and Spirits Trade Association, said: "Today's Government figures confirm the continued fall in overall alcohol consumption in the UK and reflect changing consumer tastes around Europe with more people drinking at home and a preference for drinking alcohol with a meal in a restaurant. "While we should be concerned by the rise in alcohol related-deaths, it's important to remember that overall alcohol consumption has been falling now for several years, suggesting Government efforts to combat alcohol misuse should be focused on the minority of people who drink excessively, not the vast majority who enjoy a drink in moderation." "These figures are a stark reminder of the needless waste of human life which results from our destructive relationship with alcohol. "Despite increased investment in public health campaigns to address problem drinking and the harmful effects of alcohol, deaths from alcohol abuse have more than doubled in the last 16 years and are still rising. "We must take tough action now to tackle cheap drink, round the clock availability and insidious marketing and promotions that influence drinking behaviours."